Any baby collects an abundance of teddies so why not consider researching the gift market further. A personalised star is the perfect different gift that no one else would have considered buying for a baby prince. 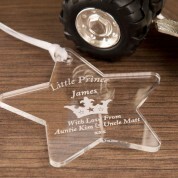 Each star is laser engraved in house with the prince's details and a short love from message. 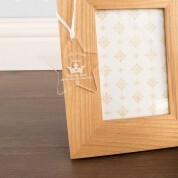 It is a lovely home accessory that can be hung up on the end of his cot or on the wall of the nursery or his bedroom. 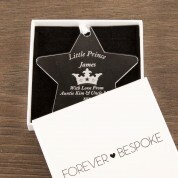 It is well presented in a branded box so when the prince grows up it can be kept safe in its box with his other keepsake gifts.